Speaking of cute characters, how are you doing tonight? 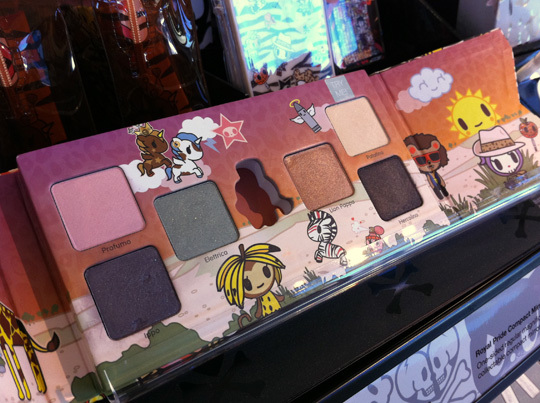 I wanted to show you this Tokidoki palette I spotted at Sephora. 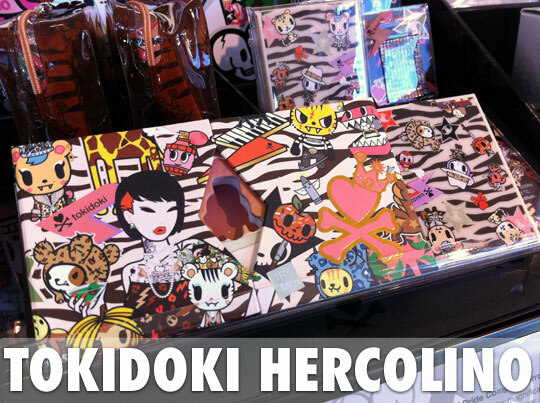 It’s called the Tokidoki Royal Pride Hercolino ($28). Check out that dual-door design (CUTE!). There are six powder shadows inside, but the Tokidoki artwork is really what caught my eye. That space in the middle, by the way, is supposed to hold a cute little charm (a keychain fob of Hercolino, aka Little Hercules). I was this close to bringing it home until I swatched the colors. I was hoping they’d pack more pigment, but I think they look a little too sheer on me (I’m a MAC NC42). If you’re a lighter lovely, however, and a Tokidoki fan, you might want to take a closer look. Oh my gosh! That is super sheer. 🙁 The packaging is so adorable but the proof is in the pudding! Oh well. Holy sheerness, Batman! No thanks. Now that I’m able to do more complicated looks without it taking forever, I’ve been getting more adventurous with my eye makeup, and there is no room in my heart for such sheer shadows. On top of that, I’m pretty sure there’s no room in my BATHROOM, either. I’m running out of space for all my makeup! That’s way too sheer. What a shame! The packaging looks gorgeous though. I have the brushes. I ADORE them. Really hard to store though….But fascinating to look at. 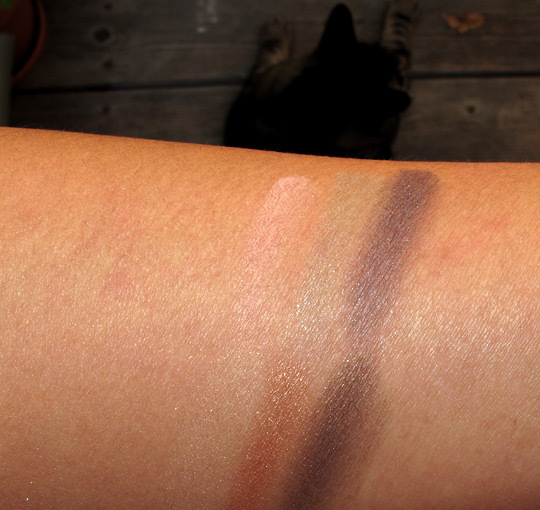 Oh wow, it only looks like three were swatched! Are the other three really that sheer? It’s a shame some of the shades are so sheer. The packaging is super cute! i own all of the big tokidoki palettes and id have to say the eyeshadow/blush quality is pretty impressive! the royal pride will be my next purchase! On a positive note…that might be the perfect palette for my 10 year old to use for play. I don’t mind her playing with makeup, I do mind too dense shadows. The sheerness and cuteness of the packaging might make it a win for the tween crowd mommies or gift buying aunties. The packaging and name are so cute, shadows are a complete pass though! I personally stick to the little quads and I recycle all my tokidoki boxes.I personally love all the products (a lot of which I have! ).The eyeshadows are wonderful IMO!They don’t like to be blended I think…That or they don’t agree with UDPP when blending.I’ve been loving TKDK since I saw Simone Legno’s lines of bags and accessories.When I found out he was releasing a makeup line,I spa zed.XD So much TKDK love.